Ring Resizing. You can customize the following things given below Engraving (No. of characters will subject to size and space in the jewelry). If you have any queries related to the product or service you can expect a reply within 12-48 hours of inquiry. 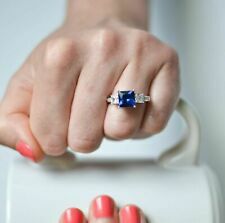 With quality diamonds and sapphire, the ring weighs 4.7 grams. The fourteen VS2 G color round brilliant cut diamond accents give this ring its total diamond caratweight of 0.42 carats. We buy all of our jewelry from reputable jewelers in closeout sales, as well as estate sales. So its better for us to communicate for faster and better resolutions to any dispute. You will be responsible for all import duties in your country. If so we won't take the product back. We assure you to give a satisfactory resolution to it. We advise removing this ring when being exposed to any type of substance or chemical. If You'r not 100% happy With Your Order GET IN TOU CH. Style Solitaire Diamond Clarity VVS1. Diamond Shape - Princess Cut. Diamond Cut Very Good. Diamond Type Lab Created. Diamond Color D. We also deal in wholesale and export of 14 K,18 K Handmade and Machine made Gold Diamond Jewelry. STONE SHAPE: Princess. The Stone Has Fire. RING SIZE : US 7 ( Free Resizing). STONE COLOR : White. TYPE: Cubic Zirconia. We can't afford to make them even a little disappointed & so our all efforts will be to provide best quality products at best possible & competitive prices. 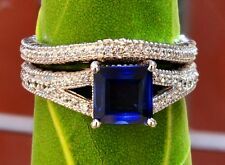 ; Center is 1.50 carats Brilliant cut Lab Created Blue Sapphire. ; Made in 14K Solid White Gold. (not gold plated). ; Brilliant cut, beautiful shine and loop clean. Shape : Solitaire : Princess. This new certified 3.0ct diamond and sapphire ring is set in 14k black gold (an advanced electroplating solution of black rhodium with stabilizer is applied to the ring for its black finish). 14K White Gold Over. Diamond Shape Princess. White Diamond. All Ring Size Available from 4 5 6 7 8 9 10 11 12 13 14 & All Middle Size Available. Diamond Color. Diamond Clarity. Note : All Designs Are computer generated designs. The ring features a spectacular princess cut diamond solitaire, prong set at the center of the design. This center diamond is GIA certified, weighs exactly 1.51 carats, and shows a lot of fire with its near colorless H color, and loupe-clean VS1 clarity. Halo Rings. Trio Diamond Ring Set. Bridal Set. Solitaire With Accent. Wedding Bands. His And Her Wedding Ring Set. Everything is beautifully set in an 14K White Gold setting with an approximate gold weight of 5.00 grams. 14K White Gold. Diamond Shape Princess. White Diamond. All Ring Size Available from 4 5 6 7 8 9 10 11 12 13 14 & All Middle Size Available. Diamond Color. Diamond Clarity. Note : All Designs Are computer generated designs. P 2.25 CTW DIAMOND SAPPHIRE ENGAGEMENT WEDDING RING SZ 6 SZ 7 SZ 8 + GIFT SALE! USA ONLY SPECIAL! THE REAL DEAL! GIFT BOXED! Color Stones Change (White Topaz, Blue Sapphire, etc). Ring Resizing All Ring Size Available. The Gold /silver/Alloy we use do not contain Nickle or substance that can have any reaction on the skin. Want to add A Personal Touch to this piece?. Diamond Shape: Princess & Round Brilliant Cut. Diamond Type: Simulated Lab Created Diamond. 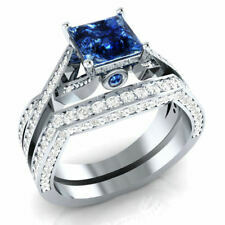 Diamond Color: Blue & White. Diamond Weight: 2.82 cts. Diamond Clarity: VVS1. Ring Type: Solitaires with Accents. If you have a particular design in mind, we can manufacture customised products as well. We use AAAA quality stones which gives even better radiance than real diamonds & gemstones. Pure 925 Sterling Silver Jewelry. We use AAAA quality stones which gives even better radiance than real diamonds & gemstones. Pure 925 Sterling Silver Jewelry. No alloy, nothing. If you like to make any changes to be made on a particular product of ours for ex. 925 STERLING SILVER. SILVER RING. PRODUCT STYLE. 5.200 GMRS (Approx). Signity Diamond's are bright white man made diamonds with more sparkle than natural diamonds. Dispersion Or Fire ( Sparkle ). Their cut is so accurate a star is visible through the top of the crown with a diamond scope. Pure 925 Sterling Silver Jewelry. No alloy, nothing. If you have a design in mind, we can manufacture customised products as well. If you like to make any changes to be made on a particular product of ours for ex. » We are in this industry since 20 years. » If you have a particular design in mind, we can manufacture customised products as well.